Pentek RFC-20 radial flow carbon water filters produce healthier, better-tasting drinking water. 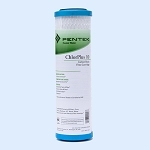 The Pentek RFC-20 water filter provides effective chlorine taste and odor reduction (based on manufacturer's internal testing). 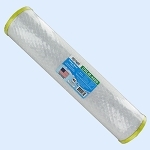 The Pentek RFC-20 filter cartridge has a unique design that reduces carbon fines in filtered water. 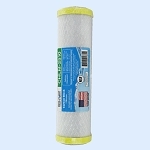 The Pentek RFC-20 water filters are constructed with a 70-micron porous polyethylene outer shell and durable polypropylene end caps. The 2-3/4" OD cartridges have a polypropylene core and the 4-1/2" OD cartridges incorporate a spun polypropylene core. Sandwiched between the outer shell and the core is a bed of granular activated carbon (GAC). The unique radial flow design offers the benefits of granular activated carbon (GAC) filtration, such as low pressure drop, while at the same time significantly reducing the release of carbon fines commonly associated with GAC style cartridges. 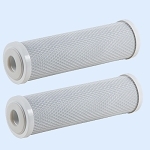 The Pentek RFC-20 water filter cartridges are ideal for point-of-entry (POE) and other high flow rate applications. Dimensions: 20" x 2-3/4" (508 mm x 70 mm). 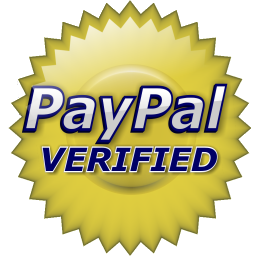 Temperature Rating: 40°F to 125°F (4.4° C to 51.7°C). Initial ?P (psi) Flow Rate (gpm): 0.60 psi 2 gpm (0.04 bar 7.6 L/min). 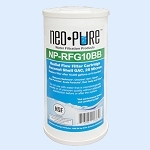 Chlorine Taste and Odor Reduction Flow Rate (gpm): >6,000 Gallons 2 gpm (22,700 liters 7.6 L/min). Filter Media: Granular Activated Carbon.